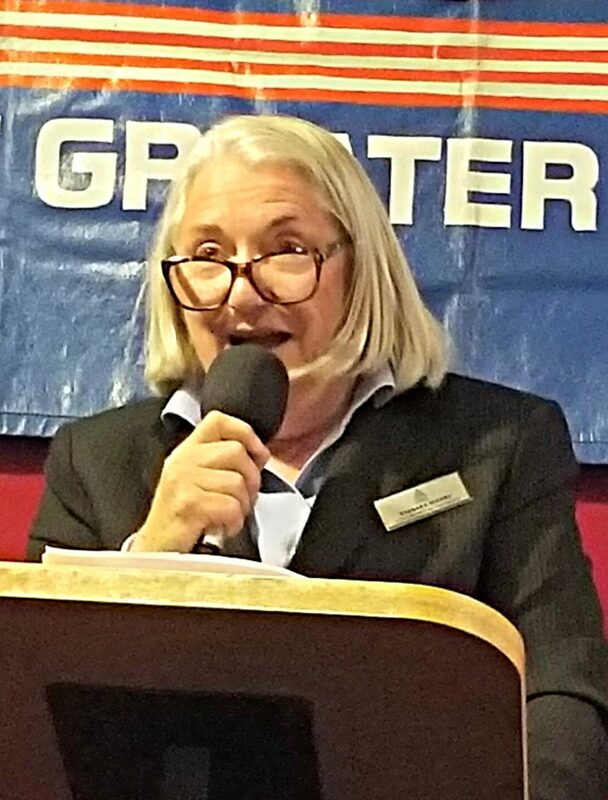 Staking out a position as a fringe candidate, Barbara Sherry, who is running for Congress in Tucson’s CD2, warned about chemtrails from Davis-Monthan airbase, broke a promise to support the winner of the primary, and rambled about pecan trees, Nazi Germany, and potholes. The chemtrail conspiracy theory is the false claim that long-lasting condensation trails, called “chemtrails” by proponents, consist of chemical or biological agents left in the sky by high-flying aircraft and deliberately sprayed for purposes undisclosed to the general public. At the Feb. 26 CD2 candidates forum in Green Valley, Sherry promised to support the eventual primary winner in the Congressional race – but now she disavows the pledge. Regarding other positions, Sherry said she supports Medicare for All, outlawing automatic weapons, term limits, and paid family and medical leave insurance. Many of these positions are stated in a PDF, posted upside-down, on her website. It was unclear what Sherry was talking about. Notably, the federal agency, which runs the Central Arizona Project and is setting aside Colorado River water, has said water should go to the Tohono O’odham and other Indian tribes and not for new development. Sherry will be at the Represent Me AZ CD 2 Democratic Candidate Forum on May 3, 2018 from 6:30 pm – 8:00 pm at Catalina High School, 3645 E Pima St., Tucson. Granting that pecan orchards consume lots of water, note that this is far from Sherry’s claim of 600 gallons PER MINUTE! This kind of shoot-from-the-mouth is Trumpian in style and substance. She lost my vote. The effects of particulate matter like this is precisely the kinds of things she’s talking about: Emphysema, Asthma, other COPD symptoms. Also the expansion of DMAFB is not making it bigger, but bringing in the F35 which is a huge noise polluter. I remember the bad old days when aircraft from DM flying in for a landing would force my school teachers to stop what they were doing until the 6 or 8 planes were past because no one could hear them anyway. There is no reason on the planet to be growing pecan trees in Southern Arizona. They consume enormous amounts of water that we simply cannot afford. We live in a desert. We don’t actually have any candidates talking about these issues on a serious level. It’s interesting that you ridicule this woman, Mr. Bodine. I have to agree with her about Ann Kirkpatrick, who has been handpicked for CD2 by the Democratic “leadership”. Tell me again what Miss Ann has against Medicare for All? That we have no way to pay for it? Is she even slightly aware of what we are paying for healthcare (that excludes millions of people) in the US compared to other nations? I won’t be voting for Ann The-NRA-Once-Loved-Me-Now-They-Don’t Kirkpatrick in the primary, but I will vote for the Democratic candidate in November, to be sure. And if it’s Miss Ann, I’m not going to like it. I didn’t ridicule Barbara Sherry. I took an audio recorder with me to the meeting and quoted her verbatim. Please explain your unwavering animosity against Ann Kirkpatrick. Are you working for the Matt Heinz or Mary Matiella campaign? No, I’m not working on a campaign right now, but my favorite candidate is Billy Kovacs. I also like Matt Heinz. Not liking a candidate, in this case not wanting to be represented by a particular candidate when I believe there are better choices, is not tantamount to “unwavering animosity”. I probably wouldn’t say anything about Ann Kirkpatrick at all if she were not the handpicked favorite of the Democratic leadership. Apparently, we’re still waiting for the Democrats to learn that their chosen candidates, the “ones who can win”, are not necessarily the voters’ favorites. It seems that would be the unfortunate lesson of the 2016 presidential election. More guns equals more dead people. There is no debating this, no matter how loud the NRA squeals. I do not vote for candidates who do not accept facts. I’ve never been shot and I pray that I never will be. But the difference between me and Ann Kirkpatrick is that I can imagine what that would be like based on what I read and what I see. And I am also aware of the devastated families and lives that are associated with gun violence. But Miss Ann wasn’t aware of the devastating consequences of gun violence until 2011 (she was 61 years old) when it happened to someone she knew.